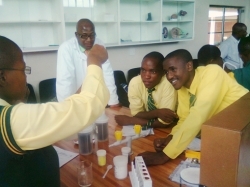 The Pongola Science and Mathematics Enhancement Programme targeted Grade 11 and 12 learners taking Physical Science and Mathematics, and aimed to improve learner results and advance teacher skills in these subjects in the 32 secondary schools in the Pongola Education Circuit, Zululand Education District of the KwaZulu-Natal Province in South Africa. (Most of the schools are in deep rural areas, and the majority of the learners come from impoverished and historically disadvantaged groups.) 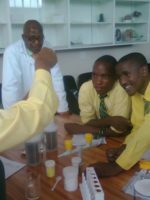 One of the specific objectives was to assist learners to gain access to tertiary study in science-related fields, for which it showed some extremely pleasing results. A stated goal of the programme was to assist learners to gain access to tertiary study in science-related fields. Each year, about 80 learners were selected from 16 of the 32 secondary high schools in the Pongola Education Circuit, and were given tuition by professional MIET AFRICA tutors on Saturdays and during school holidays at the Phongola Education Centre. Results were astounding. For example, in the matric exam in 2013, of the 29 distinctions in Mathematics achieved by learners in the 32 schools in the circuit, learners in the programme (selected from only half the schools) achieved 27 of them. For Science, it was 19 out of 20. In 2014, 73 of the 80 participating learners achieved “bachelor passes”, entitling them to university entrance. The programme was funded by the South African Sugar Association through its trust fund, Sugar Industry Trust Fund for Education (SITFE). Funding for Phase I of the programme ended in 2014. 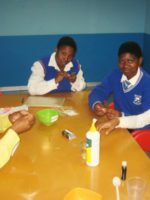 However, MIET AFRICA and the district were successful in securing a once-off grant for 2015 from a new funder for scaled-down activities: these included two holiday block sessions of classes for learners in Grade 12, and consolidation of work done in the previous phase, including support of the subject committees formed in Phase I. The Mathematics professional learning community is continuing its activities as a local branch of AMESA. The 2015 extension was funded by a local sugar mill, TSB. In late 2015, SITFE contracted MIET AFRICA to conduct research into the education support needs of schools and communities in the sugarcane growing areas in KZN and Mpumalanga. The project was a successful collaboration on a research project, involving researchers from the Durban University of Technology, EduAction (a GIS specialist) and MIET AFRICA’s M&E and Research team. Once finalized, the report was presented to and accepted by SITFE’s Board, which subsequently asked MIET AFRICA to facilitate a workshop to assist it with planning its next three–five-year corporate social investment strategy.